Flowers from Good Friday church services may be used to protect cattle. Good Friday is indicated because of the connection to the resurrection. 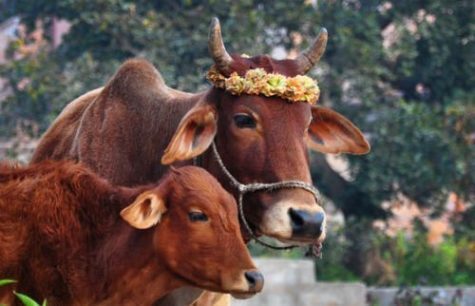 Because of cattle’s intrinsic connection with human fertility, any sacred day with fertility overtones, such as Beltane or Midsummer’s Eve, may be substituted, or a day with personal resonance for you if more appropriate. Collect some of the flowers following the conclusion of the service or ceremony. Burn the flowers, together with seven teaspoons of flour and three teaspoons of salt. Gather up the ashes and sew them into a sachet. Reserve until needed. Should a cow fall ill from natural or suspicious causes, break the sachet open and rub the ashes over the cow’s belly three times, always in the same direction. Alternatively, place the unbroken sachet on the ground. Lead the cow over it three times, always walking in the same direction. Did you ever meet someone, an elder perhaps, someone wise and calm, joyful and seemingly ageless, who seems to possess a deep inner peace? Someone who seems to have lived forever, seen everything and has the answers and advice to help us with all our problems? If we don’t know someone like this, we wish we did, or we long for these qualities in ourselves—the patience and understanding to overcome any obstacle and the ability to learn from our challenges, while keeping a youthful glow and enjoying each day, and finding beauty in everything and everyone around us. Sounds impossible, right? We often attribute these characteristics to fantasy figures. But there truly are people who live this way, yet if we don’t personally know any of them, it seems like fantasy. So, let’s use fantasy as a bridge to reality, through the magic of the unicorn. Legends of the unicorn speak of them as wise and immortal creatures. 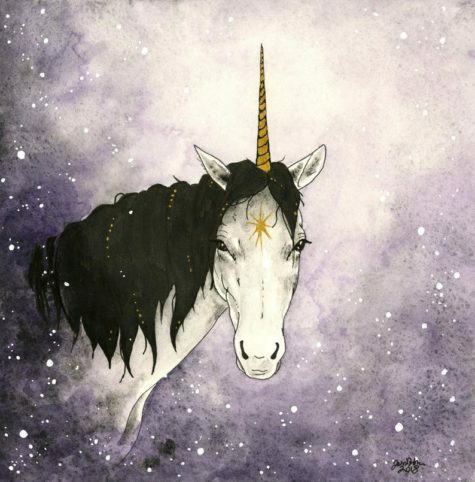 This spell is for the unicorn to help us age gracefully with a youthful carefree spirit. This is for people of any age, to ensure the lively and energetic qualities of vitality and joy and, in addition, to help us learn patience and gain wisdom. Use your intuition when selecting the oil or blend of oils. Choose a scent that uplifts you and makes you feel cheerful or one you associate with happy memories. Sprinkle a few drops of the oil on the ribbon. Visualize the unicorn, a wise and experienced sage. 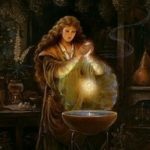 She has lived forever and endured many challenges with grace, and now she is bestowing her magic upon you. Make this visualization as detailed as you desire. If this proves difficult, suspend your disbelief; pretend you are a child again. You meet a unicorn in the wild. Because you carry the white ribbon, the unicorn knows you are a kindred spirit. This ribbon is your link to the unicorn. You drape it around the unicorn’s neck and the two of you walk as companions through the forest. The unicorn confers wisdom upon you. This special wisdom contains the secrets for a happy life, whatever that may be for you. Tie the ribbon around the statue. 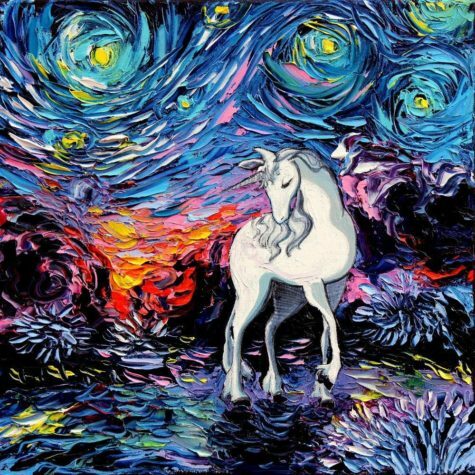 This is symbolic of your meeting with the unicorn and your initiation into her mysteries. The secrets will unfold throughout your life as you need them. 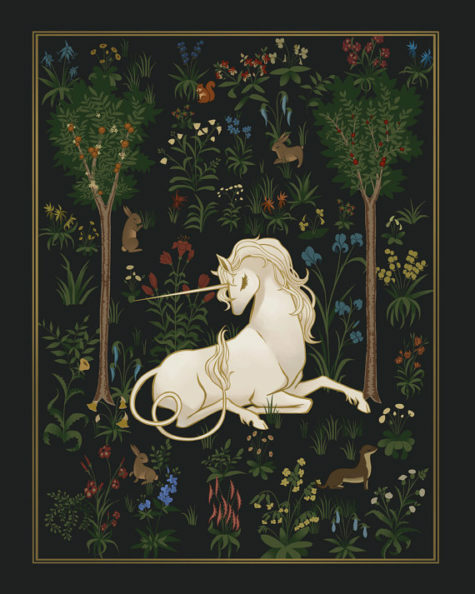 One of the ways your higher spirit can help you discover what you need is through the use of symbols; the symbol of the unicorn can be a gentle and inspiring teacher and guide. May your youthfulness and spirit stay with me. May your endurance always offer possibility. May your strength be at my side in every way. May your gentleness and grace bless all my days. Draw what your unicorn will look like. Color in your unicorn, according to the element of your choice (fire, earth, air, or water). Draw yourself next to your unicorn. Draw your height next to the drawing of yourself and color yourself in (optional). Fold the paper hamburger style. Write it’s info in either side ( name, element, breed, coat color, accessories, behavior, wingspan if have any, tail, what it eats, speed, etc). Fold paper hamburger style again. Write and say this aloud: ” _____ (element) unicorn of mine, come to me, by egg of _____ (element). I summon the newborn mythical creature. So mote it be.” Then fold paper again. Draw a pentagram know either side. Now fold it once more. 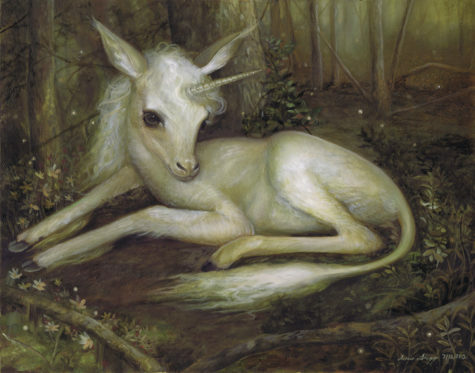 With a magical horn positioned precisely at the intuitive center (also known as the brow or third eye chakra), unicorns are strong symbols of psychic power. 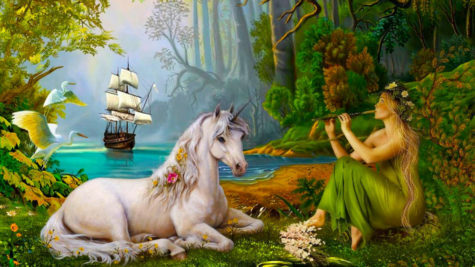 To enlist a unicorn’s help in activating your intuitive abilities, relax, close your eyes, and envision yourself in a fairy forest. Journey deeper and deeper into the heart of the forest, knowing that you are approaching a unicorn spirit guide. In time, you will make contact. Where in the fairy forest does he or she like to hang out? 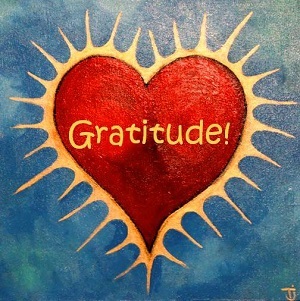 And what messages does he or she have for you about how to activate your intuitive gifts? When your communion with this magical, inter-dimensional creature feels complete, thank him or her with an offering or a gift. Whatever feels right to you will do, but keep in mind that unicorns have been known to enjoy apples, crystals, shiny objects, and bubbly drinks. In the future, you can consult with this guide to receive intuitive messages and learn how to further activate and calibrate your psychic and intuitive gifts. Where there is an apple tree, a unicorn is never far. 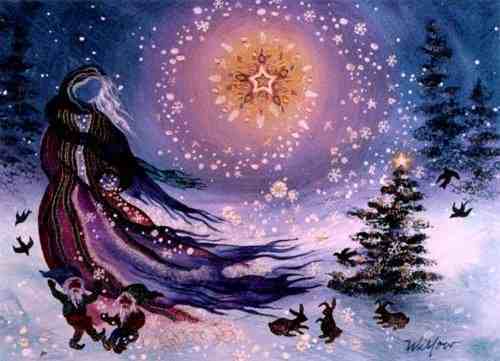 For this wish granting spell, visit an apple tree with a bottle of cold champagne and a moonstone. Take a moment to relax and connect with the spirit of the tree, as well as its unicorn ally who is likely dwelling nearby, just beyond the veil. When you feel grounded and connected to the magical realm, safely open the champagne and pour it around the roots of the tree. Then, speak from your heart. Explain that you have come in the hopes of enlisting the unicorn’s help in granting your wish. If you feel a rush of positivity and love, that is an affirmative: the unicorn desires to grant your wish. So speak your wish aloud. Then feel and express gratitude, and place the moonstone by the base of the tree. 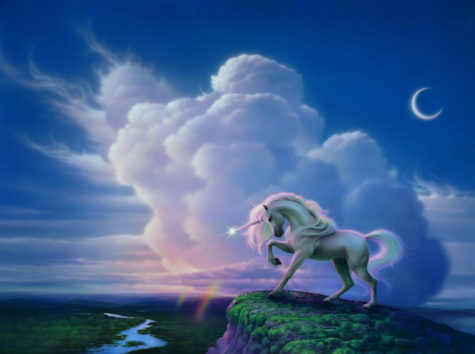 “Moon light magic call all unicorns call the rainbow tonight. Hear my plea transform me make me a unicorn. I will join the fun and help clean up when done. Give me the power to … (choose one from the list below) … so unicorn I shall be”. Say that three times with your hand over potion. Then take the cotton ball dip in potion and dab all over your body. Just snap to become one. In your mind’s eye, see the sacred center open before you: watch the mists part, see the door to the Otherworld open, or watch the spiral of the magic from between the worlds reveal the Otherworld. The Gates are now open, and the true work can begin. Optional: If you have a patron deity, one that you might wish to offer to specifically, now is the time to do that. If not, simply move to the next portion. Now, take your divination tool up. If you don’t have one, you can use an athame, feather, wand, or even your hand. In your mind’s eye, see the sacred center close before you: watch the mists gather, see the door to the Otherworld close, or watch the spiral of the magic from between the worlds close in on the Otherworld. The Gates are now closed, and this rite is ending. I came across a very ancient galdor spell. 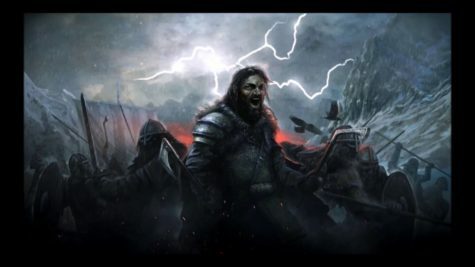 (A galdor spell is one which uses the sound of certain Viking Runes as an incantation.) 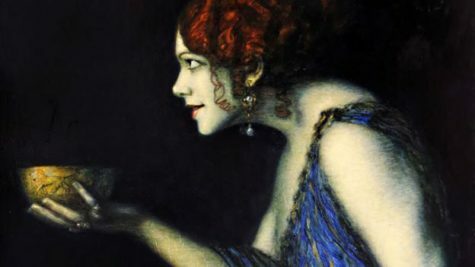 Traces of its use can be found in many cultures. It is generally used against one who has wronged the wizard who pronounces the curse. Make sure you read the whole thing before you try it. Be aware that use by novices is not recommended. 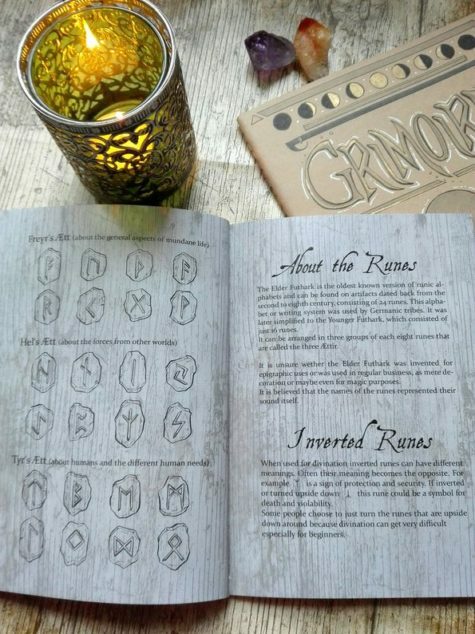 Note: The runes used in the curse are shown next to the curse itself. This spell requireth ye hand gesture to be made in ye following way. Extend thy power hand outward toward thy intended target with thy palm facing thy face. Fold thy thumb, first, third, and small fingers into thy palm. If this be done properly, then ye finger of death and damnation shall be extended towards the heavens. This being done, the wrongdoer’s fate is sealed. Great care must be taken with this most potent curse. It has been known in some instances for angry howling demons to take control of the intended target, causing great bodily harm to the unfortunate wizard.